Work Pressures fills the void of research on the nature of pressures on individuals in the workplace. 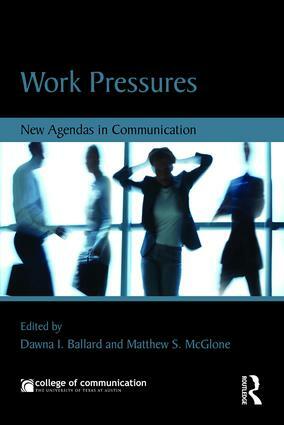 It offers a broad view of how work pressures can compromise the performance and vitality of individuals and their organizations. The contributions to this volume not only confirm communication’s centrality to the problems work pressures pose, but also open an interdisciplinary conversation about how to learn from and, ultimately, manage them. Specific topics covered include the proliferation of communication technologies, organizational discourse, work overload, and generational differences in the workplace. Why Do We Blame Information for Our Overload? Dawna Ballard is Associate Professor in the Department of Communication Studies at The University of Texas at Austin. Matthew McGlone is Associate Professor in the Department of Communication Studies at The University of Texas at Austin.